Lately, I’ve been talking about more benign things like Gooseberry Pie, Currant Jelly and Sauerkraut. I know I have a few foodies that read my blog, so I’m very curious about what strange things people have eaten. But here’s a little bit of the back story. Before kids were in the picture, my husband and I had a rule to leave the country at least once a year. In addition to traveling for pleasure, we also both have traveled to Europe and the Far East for work as well. We both have had to add extra pages in our passport. Being frugal, we always would research places where the dollar exchange rate was very strong. This usually meant developing countries, like Thailand. We saved in other areas so we could spend on vacations. Thailand had the most amazing fruit. We lived off of it there. Most of the meat was cooked in open air carts and a lot of it was just hanging in the air with flies all over it, so we didn’t experiment much with the meat. Our friend’s dad took us to a very nice restaurant and I ate a lot of traditional food. I have no idea what the meats were, but I wouldn’t be surprised if I ate dog or cat because some were not at all a familiar flavor. Some weird thing that tasted like a cross between a pineapple, onion and garlic. It was gross and smelled really bad. I don’t remember what it was called. It was the color and size of a pineapple but had layers like an onion. Lamb – Okay, I don’t like mutton so that was exotic for me. Wallaby – that’s like a small kangaroo. It was delicious and it tasted like steak. Butterfish – We did a fishing charter and gave our fish to a retired local. He had us over for dinner and prepared it. He needs a story of his own. He was growing things in bathtubs and had all kinds of wild fruit in his yard. Breadfruit – Dessert at butter fish guy’s house. Most of our weird eating was done at the Carnivore Restaurant in Kenya. This was our honeymoon, and part of it was done climbing Mt. Kilimanjaro. We actually told our guides we were vegetarian when they stopped at the side of the road and pulled some dead meat off a hook in the blazing summer. Many people got sick on that trip. Anyway, at the carnivore we felt safe because the meat was farm raised and I assume fairly fresh. Zebra (in fact that might be a zebra leg that dude is holding). Zebra was the tastiest thing of the night by the way. Biltong – this is jerky made from the Kudu and Springbock which are types of deer. This was the best jerky ever. Tripe – Yuck, I hate tripe. I was always forced to try some because it’s a kind of delicacy, but it’s gross. Cow Brain – it was made like a potato salad – yup, didn’t like that either. Pig’s Feet Jello – It is a clear jello with bits of pig’s feet floating in it. It’s served with vinegar and black pepper. Okay I have been known to eat this and be okay with it. I have never craved it though. Pickled Herring – I like it and always have some when I’m in Poland. There is no comparison to the stuff you find in the US. Fresh herring is yummy. Mooncake - This is like a fig cake with a hard boiled egg yolk in the middle. It’s a traditional food eaten during the moon festival in China. They are very sweet, which is unusual because I didn’t see the Chinese eating many desserts like we do. In Asia, I specifically avoided the exotic endangered species meals. I didn’t eat shark fin soup, or birds nest soup or any of that stuff. My most favorite food was the fresh dumplings. Yum. I don’t recall ever eating frog legs, turtle soup or escargot. I’m sure if I thought about it some more, I’d have a few others to add. I’ll end with some safety tips. If you’re in a very exotic overseas location and want to experiment, it’s best to try a touristy place either in a hotel or something well known. Yes, the Carnivore was touristy and overpriced, but we didn’t get sick after eating there. Generally we eat very little street food or meat when we travel. Fruit is great, as are COOKED vegetables and rice. There is no way of telling how long that hunk of meat has been hanging out on that hook and in many tropical countries it has got to be rancid and maggot filled from the heat and flies. Only drink bottled drinks. Don’t use ice. Bottled Beer is usually very safe and tasty. Always pack Imodium. Now it’s your turn. What strange food have you tried? Are there any that aren’t on my list? Oh please tell me you get pineapple in the States!!!! Really? Jackfruit, starfruit…I don’t remember them but I remember their names from Malaysia. Also, durian – yellow and SMELLY LIKE YOU WOULDN’T BELIEVE. I’m pretty picky about my food. I don’t like tofu and I won’t even eat chicken legs. Yes, we have pineapple in the states, but it’s not nearly as good as the stuff locally grown. I live in a very cold part of the country and our pineapples travel thousands of miles and are picked green. I ate at least a pineapple a day when we were in Thailand. They were so good there. I guess it’s not weird but a memorable part of my journey. I actually didn’t eat many weird foods in Europe (great bread) or South America (great grilled beef), but here in the States, I’ve had ostrich, alligator, emu, cow brains, tongue, tripe, raw oysters, snail, deer, rabbit, squirrel, and wild pig. I would probably only have tongue, deer, rabbit, squirrel, and wild pig again…the others were either not worth the price or icky (brains are just icky). When I took a trip to China about 2 decades ago, as part of an student-exchange program, we were served all kinds of interesting things. Needless to say, the food wasn’t like “Chinese” food served here at home in the U.S. Not even close. I learned that real Chinese food is vastly different. One big part of the food situation for us, in our over 3 week trip, was that we were told NOT to ask what were being served. Our U.S. chaperones informed us that it would be considered rude, and that we should only ask AFTER we were done eating. Looking back, as I’m now a nutrition label-reading person, it’s hard to imagine that we all just went with the flow. 1) On the flight in, we were “treated”to an airline meal which included pig intestines and sea slugs. That was like a cold bucket of ice water on the expectations of a kid from the midwest who was used to chinese food meaning kung pao chicken. It was an amazing experience going there, though I have to say I was thankful to come back home to the U.S. Funny, I still eat kung pao chicken as my version of “Chinese” food, though now I know it’s totally fake. Ted – I think I had bay bugs too. I totally forgot about them. They’re kind of like crayfish. Yup. They were good. Crystal – Way to find weird food locally. I’m impressed. I’m with ya on the brain. Ptewey. Squirreler – I think I actually gained weight when I was in China. I really enjoyed the food there. The vegetables in the dishes were always very tasty. Most of the time the meat was too..even if I didn’t know what it was. I would love to take a family vacation there once my kids are older. Wow that’s a very impressive list! I was going to say frog legs (taste like chicken) and escargot (oddly enough, the reminded me of stuffed mushrooms). I’m against using the term “weird” to describe food anywhere for the word’s negative connotations (or maybe the ethnocentric connotations that some foods are “normal” to eat and others are not, whereas it’s very clear that normal varies considerably place to place!). – fermented bamboo shoot curry, in India. This was so, so, so delicious, and I would make it every day, except that these particular bamboo shoots come from a very remote location in eastern India. Alas. – every part of sheep possible, in Morocco. Eid-al-kebir is a Muslim holiday celebrating Abraham’s sacrifice of his son (similar story to that in the Bible, when Abraham raises his knife to sacrifice, a ram appears and God tells him to have the ram instead). Every family gets a sheep and kills it and eats it. We ate stomach, brains, testicles, intestines… oh my! I was pretty sick of sheep at the end of two weeks, when we finally starting eating non-sheep food again. The weird fruit is probably durian. In Thailand, I’ve had fried flying ants, ants eggs, horseshoe crab, bird nest, ?? forgot what else. Fish maw soup isn’t really exotic, you can get it at most Chinese restaurants. These days I’m trying to avoid exotic species too, no more shark fin soup. OK, I am a loser because I have never traveled anywhere. Wait, I was in Tijuana with my brother and he ordered a burrito and instantly had some issues. You have inspired me to travel, this post was fascinating! Money Reasons – travel has always been a priority since I studied abroad in college. It really opened my mind to new thinking and different perspectives. Valerie – I don’t consider weird to be a negative word. I describe some of my friends as weird and they are okay with it. Exotic probably would have been better but it sounded snobbier to me. Anyway, I have never been to Morocco or India (my husband has been to India 2 or 3 times). I would love to go. The only part I like of sheep is the milk if it’s made into cheese. Everyday Tips – The only thing I like from your list is Heart. Liver is sometimes tolerable. Babci loves liver and onions. I think part of it is our poor upbringing. Generally that stuff was pretty cheap at the supermarket and many people find it tasty. Plus, the flavor is usually pretty strong, so a little went a long way. “retirebyforty”‘s McRib comment reminded me of another manufactured meat classic from the 80’s: Frank-N-Stuff hot dogs. They were the hot dogs that were basically hollow meat tubes with chili on the inside. Man, did I eat more than my share of those things as a kid. Definitely weird, and definitely great while they lasted… I also totally forgot about eating “Scrapple” in eastern PA too. 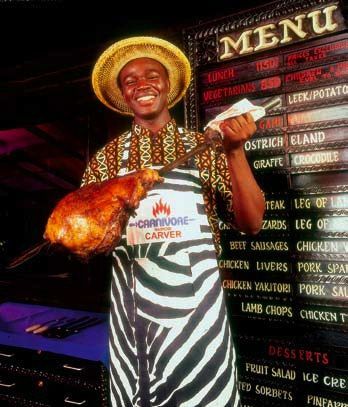 I love Carnivore in Nairobi. I think every visiting foreigner has been there and has eaten some exotic meats. The weirdest thing I ever ate was an ant eggs cake (?) in Mexico and all kinds of funky stuff in Japan, but I can’t even recall the names of these things. The grossest thing I ever drank was airag – fermented horse milk in Mongolia. It tasted like a mix of really dry cider (not the British kind) and sour milk. Other than a mystery soup that was prepared by the locals in Argentina (it had slimy bits), my eating adventures have been pretty boring. I have clients who are Chinese and often take us out to their favorite restaurants and order our food in Chinese. Since I’m the vegetarian I get to opt out of most dishes by default. But I get to take pictures of my co-workers eating chicken feet! Ted – I vaguely remember Frank n Stuff hot dogs, but have never eaten them. I like how you categorized manufactured meat as weird food. So true. Aloysa – Yup, traveling is awesome. It has always been a priority ever since I did a study abroad in college and got the bug. I can’t wait til my kids are old enough to be able to go to some of the more exotic places again. CTreit – Mongolia and Ants..Well, you’ve got me beat. Ah, there are still so many places I’d like to go. Lindy – I think that’s why I hate oily fish. They are always slimy.I heard once that the US is the biggest exporter of Chicken Feet to China. My aunt puts them in her soup for flavor, but generally doesn’t eat them. I want to go to those places, but not eat those foods (other than the tasty fruit). I would just be heartsick to eat a dog or cat; it would probably convert me to vegetarianism! There’s no way I’m going to willingly eat bugs even though they probably aren’t as bad as I imagine. P.S. However, I do love the McRib and have made a couple of trips to McDonalds in the past month to get that pressed pork delectable! Kay Lynn – I never understood why dogs and cats hold a higher status in our society. Yeah, cats and dogs are cute, but cows are too. The animal lovers are going to hate me for saying this, but if you’re okay eating pigs and cows and chickens, then you should be okay with eating other mammals too. But I could certainly see transferring your feelings for a personal pet to a food item. I’m sure it’s tough and I don’t know how meat farmers don’t get more attached to their animals as I know a lot of them love their herd dearly. And I thought fetal pigs were only for dissection in high school biology classes! Who knew? The strangest thing I ever ate was rattlesnake at a restaurant north of Cheyenne, Wyoming. Ah, heck, I’ll plug it… The Little Bear Inn. It was delicious! Tasted just like chicken, but it was very bony and a lot of effort to eat. I’ve also eaten bull testicles at the same place. Those aren’t too bad either. If you didn’t know any better they taste like chicken fried steak. Len. The moral of the story is that I have to try a lot harder to find exotic foods in the US. I guess I’m not very adventurous when I travel in north america. Certain types of Eel are bony like that snake. I think I’d try testicles. Why not. I just stumbled across this following interesting blog links. I like to experiment with food when I travel, too, although I do follow standard food safety rules. Like you, I’ve had zebra and kudu in Africa (Zambia, to be exact) where I also ate possibly the strangest thing I’ve ever had: fried caterpillars. They were dried, reconstituted, and then pan fried until crispy and tasted similar to crispy pork rinds. Not bad, but not really something I’d eat all the time. Other protein items I’ve eaten that aren’t frequently served in the US: alligator, buffalo, conch, deer, eel, escargot, frog legs, octopus, pheasant, rabbit, squid. While in Zambia we ate pumpkin quite a few times as it was a popular side dish and also pumpkin leaves. Very tasty made into a stew with ground peanuts. Like you, I love pickled herring. Unlike you, I love kimchee and have a jar in my fridge right now! Wow have I got some adventurous readers. Having read all of these comments, I now realize I have drawn a very distinct line at insects. I won’t eat maggots or caterpillars or stir fried beetles. I have had the opportunity to eat them, but I guess there is a point where I get squeamish and it’s bugs. About the worst thing I’ve had the misfortune to eat has been Balut (Philippines). This is a chicken egg with a partially developed embryo (or chick) inside. It’s boiled, and eaten usually on a dare after imbibing way too much beer. Well, anything goes down, given enough beer. Tried? Bird Nest soup last year from like http://www.geocities.jp/hongkong_bird_nest/index_e.htm . Tastes really good… yeah, I thought it was gross at first, but wow, you won’t regret it. Thanks for opening my eyes to this! Never would have thought of these, maybe I will try some soon. I’ve also written a similar post about foods you didn’t know you could eat.